Sky has given the electronic programme guide (EPG) on Sky+HD boxes, known as Sky Guide, a lick of virtual paint. The HD makeover puts on demand content front and centre, thanks to the success of the Sky Anytime+ service and on-box movie rentals. 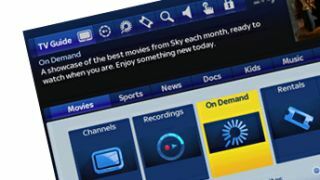 Sky customers will start to see on demand content pop up on genre pages as well as in the options menu across the top of the guide. Excellently, you'll be able to see more channels per page for the EPG, as well as browsing recorded programmes by genre rather than just chronologically. And if you don't think all that sounds good then you only have yourselves to blame – Sky worked with subscribers throughout the development process in order to ensure tip top functionality and a thumbs up for the new look. The phased roll-out will see tens of thousands of boxes getting the update today, with the rest of the customer base seeing the redesigned software before the year is out. Finally, a little treat for the fact fans out there: Sky TV customers interact with the EPG a total average of 1.2 billion times in a month.